I have to admit, I have been intrigued by former model and First Lady of France, Carla Bruni-Sarkozy, since I first heard of her visit to the UK decked in grey Dior. I scoured the internet for pictures, read dozens of articles commenting on her precision in styling and incredible success (in spite of a scandal that was attempting to blazon her as salacious before she even managed to put her ballet pumps down on English turf). 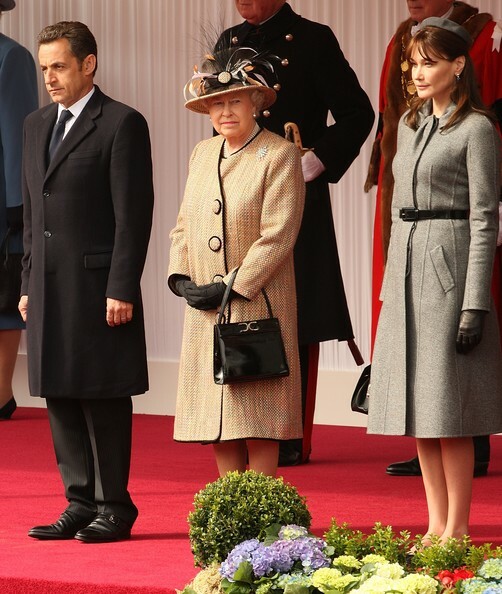 It is more than a little impressive how successfully she has managed to navigate the European fashion waters, particularly among European royalty. Maintaining faultless taste without ever doing the unpardonable of outshining or out dressing the settled Royals is no small task. 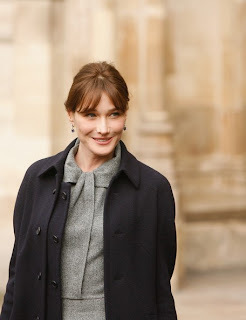 One of the many reporters who covered Ms. Bruni during her visit to England commented on how scrupulously she avoided stealing anyone's looks or colours, while still dressing in a manner that was stylistically flawless and entirely respectable. 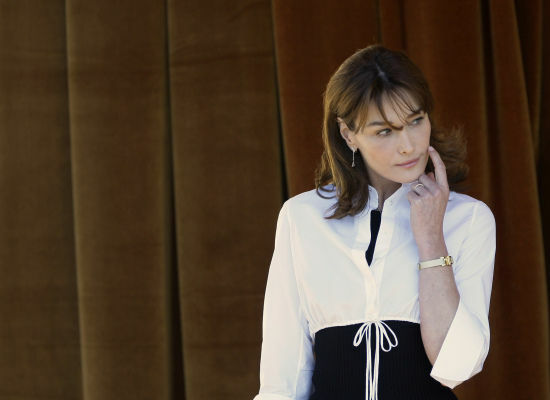 Dolly Jones, editor of Vogue.com, said: “With all eyes on her today – some of which are inevitably going to look for any excuse to be critical - Carla Bruni was perfectly demure, her tiny matching hat and rounded collar an elegant reference to Jackie O." Ms. Bruni continued to blaze her way triumphantly across the European nations and insofar as I know she has yet to receive any particularly harsh criticism on her choices in clothing. And, I have to say, I was in awe of her taste. 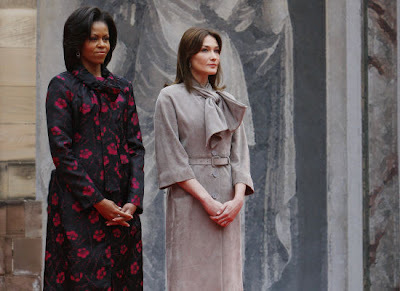 "On a recent visit to Spain with her husband, French President Nicholas Sarkozy, the 41-year-old drew praise when she stepped out in a figure-hugging cobalt blue design by Christian Dior for a lunch date with the country's Crown Princess Letizia. A supreme judge of occasion, Carla always tailors her outfits to suit to individual styles of her hostesses. On the occasion she even eschewed her usual ballet pumps for a pair of kitten-heeled Christian Louboutins, thereby ensuring they were in keeping with Letizia's signature towering heels." The author was right. Carla, and whoever her stylist is, should receive an award for their talent. While maintaining her own style and designer tastes, Ms. Bruni is able to take diplomacy to another level by making her choices reminiscent of whomever she is visiting or receiving. Whether with a Prime Minister's wife, a Queen, or Crown Princess she puts herself "firmly in sync."